PDU3VN3L1520 monitored 3 phase 208V zero U vertical rack PDU supports 5.7 kW total output capacity. Each output loading bank contains 12 outlets. Visual meter with scroll button and PowerAlert remote monitoring interface enables real-time current monitoring for each output phase. 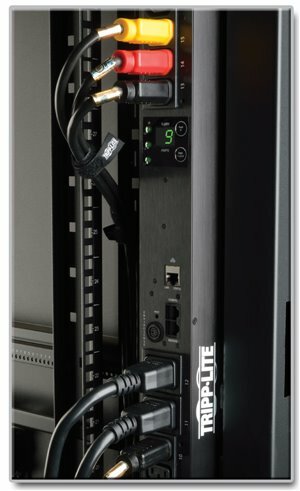 It supports 0U vertical rackmount installation.Tripp Lite 3 phase monitored PDU (Power Distribution Unit) offers real-time remote monitoring of voltage, frequency and load levels via secure web, SNMP or Telnet interface and whole rack AC power distribution. PowerAlert interface supports custom notification of user-specified remote conditions via email, secure web, SNMP, Telnet or SSH interface. PDU output current consumption in amps is displayed per-phase via front panel lighted digital display and can be monitored remotely to warn of potential overloads before critical IT mains breakers trip.Lighted display with scroll-button offers power consumption in amps for all 3 loading banks, IP-address self-identification and 180-degree display rotation for overhead or raised floor power feeds. It supports real-time monitoring of all reported functions with support for user-specified alarm and notification thresholds. Featuring a built-in SNMPWEBCARD, Tripp Lite's PDU3VN3L1520 3-Phase Monitored Power Distribution Unit provides full remote power monitoring via a secure network or web browser interface, giving IT personnel around-the-clock oversight of facility power from any location. It’s an efficient way to distribute, monitor and manage power in a data center environment. The PDU3VN3L1520 has a digital meter that displays voltage, frequency and load levels. Unfiltered electrical pass-through makes the PDU3VN3L1520 ideal for distributing alternate waveform utility, UPS or generator power in rack enclosures and network closets. It provides reliable 208V power service via 36 outlets in three load banks: 30 C13 outlets (10 per phase) and 6 C19 (2 per phase). This PDU has a rugged all-metal housing and 3 ft. cord with NEMA L15-20P 20A input. Load capacity is 5.7kW. A digital meter allows IT personnel to monitor in real time (either locally or remotely) the voltage, frequency and load per phase. It has a pushbutton for scrolling through power consumption in amps for all three load banks and rotates 180°. The meter helps ensure the PDU is used at maximum capacity without danger of overload. The meter can also show the IP address. A built-in SNMPWEBCARD enables full remote access for power monitoring, configuration and control via a secure network or web browser interface. Tiered access privileges allow both an administrator and a guest to log in and monitor the PDU via a web browser. It supports notification of all major power events and user-specified alarm thresholds via email or SNMP traps. Real-time clock backup maintains the time of day and date even if the PDU is shut down and unpowered. When used with an optional ENVIROSENSE environmental sensor module, the PDU3VN3L1520 can also remotely monitor temperature/humidity conditions and provide rack access notification for up to 4 SRSWITCH door sensors. The PDU3VN3L1520 provides 10/100 Mbps auto-sensing for optimal communication compatibility with a current 10/100 Base-T network. Protocols supported include HTTP, HTTPS, PowerAlert® Network Management System, SMTP, SNMPv1, SNMPv2, SNMPv3, Telnet, SSH, FTP, DHCP, BOOTP and NTP. DHCP/Manual configuration support provides the ability to have network settings automatically assigned to the card, or manually assigned via permanent IP addresses. The PDU3VN3L1520 is easy to integrate with a wide range of data center and network applications. It can be configured for 0U (vertical) rack installation with the included mounting brackets, and it also supports toolless button-mount vertical installation in compatible rack enclosures. Vertical 0U installation reduces cord clutter and promotes efficient airflow through the rack. The PDU3VN3L1520 comes backed by a 2-year warranty. It’s manufactured in compliance with strict RoHS specifications, reflecting Tripp Lite’s commitment to environmental responsibility.